Gastric bypass surgery is a weight loss surgery that helps you lose weight by changing how your stomach and small intestine handle the food you eat. Your stomach will be smaller and you will feel full with less amount of food after the surgery. The food you consume will not go into some parts of your stomach and small intestine that breaks down food. Who is eligible for Gastric bypass surgery? Weight loss surgery is not recommended for everyone. It is suggested only for people who have a body mass index (BMI) of 40 or more or have a lower BMI (35-40) with obesity-related problems like heart disease, type2 diabetes and high cholesterol etc. This surgery is also suggested for the people who failed to lose weight through diet and exercise or any other nonsurgical method. What is involved in a gastric bypass? 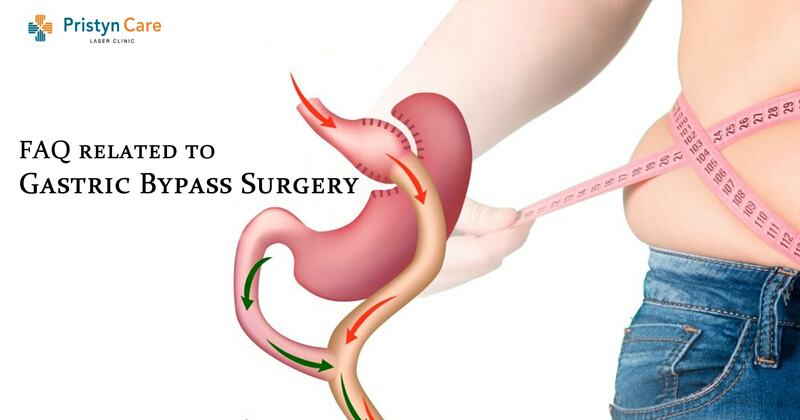 The gastric bypass works by decreasing the stomach capacity. It is done in two steps. The first step involves making your stomach smaller by using staples. This will reduce your food intake. In the second step, your surgeon will connect your smaller stomach to a part of your small intestine, bypassing the rest of your stomach and some of your small intestine. What are the benefits of the gastric bypass surgery? Weight loss in gastric bypass is rapid and dramatic. People usually lose an average of 60% to 80% of their excess body weight. And obesity-related health issues like diabetes, high cholesterol, high blood pressure, arthritis, and heartburn get better rapidly. The hunger hormone is reduced due to loss of stomach tissue which helps in controlling appetite. What Are the Risks After Weight Loss Surgery? Usual risks associated with weight loss surgery may include vomiting from eating too much too fast and not chewing well, nutritional deficiency like anemia, constipation and sometimes, wound infections that may occur up to three weeks after surgery. These are treated with antibiotics but sometimes need further surgery. What are the complications that may occur? Leakage at the several sites of reconnecting the stomach and intestine. Nausea and vomiting, bloating, dizziness, sweating, and diarrhea. How much weight will I lose after surgery? After gastric bypass surgery, the majority of people can expect to lose between 66% and 80% of their extra body weight. Maximum weight is lost within the first two years. How does the surgery affect overall health? How Does Weight Loss Surgery Affect Nutrition? After gastric bypass surgery, your body doesn’t absorb certain important nutrients properly, like Vitamin B-12, iron, Folate, Calcium, and Vitamin D. Therefore, taking a daily multivitamin, and other supplements can prevent or reduce these deficiencies.